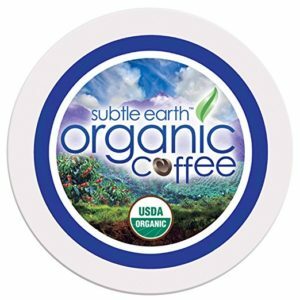 Are there good organic K-cups and where to buy it? Give us just a little of your time and find out answers on this questions. For coffee to be considered organic, it should meet some important criteria. First of all, it should be free of chemical fertilizers, pesticides, and other types of synthetic additives. Secondly, it’s essential for coffee not to be produced by the usage of irradiation, genetic engineering, or industrial solvents. Finally, it’s important that the soil where the coffee is grown had been organically treated at least 36 months before the certification. Those of you who haven’t used organic K-Cups coffee before may be surprised to find out how many great options you can find in the market. There is a large number of brands offering different types of organic K-cups coffee. If you’re lucky enough, you will be able to find your k cup organic coffee at the local grocery shop or supermarket. Even if you don’t succeed in it, Amazon.com offers numerous possibilities. In this article, we are showing you our top ten options when it comes to best quality organic K cup coffee. 7 best organic K cups coffee brands and two best organic k cups decaf. We review brands that is in our opinion deserved to be in the list. The parameters we have take into consideration are: tastes, aftertaste, smell, price, are that coffee USDA Organic Certified and biodegradable or recyclable and many more parameters. 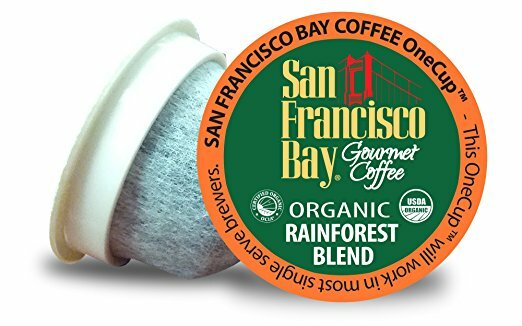 Organic Rainforest Blend coming from San Francisco Bay represents a tasteful mixture of medium roasted Arabica coffee beans enriched with interesting citrus notes, produced in Guatemala, Colombia, Mexico, and Indonesia. The coffee provided by OneCup is handpicked and carefully selected to provide the exclusive quality taste of your K-Cup coffee. Each cup is produced using plant-based renewable resources and it was designed to maximize the flavor and provide full, rich taste. The pods are made of wood pulp lidding, mesh coffee filter, and corn ring, which makes them absolutely environmentally friendly and biodegradable. Apart from Organic Rainforest Blend, San Francisco Bay offers several more flavors, including Fog Chaser, Kona Blend, French Roast, Breakfast Blend, Colombian Supremo, PURE Kona, and Variety Pack. You can order Rainforest Blend K-Cups in a large number of amounts, starting from 36 all the way to 160 cups, in one or more packages. If you order larger number of K cups price per K-cup the price will be lower. Rainforest Blend pods are compatible with the majority of Keurig K-Cup coffee makers, however, you cannot use them if you use the Vue model or Nespcafe Dolce Gusto coffee machine to prepare your coffee. Why we choose this K-cup coffee? Good Price, Delicious taste, USDA Organic, Fair Trade, Cups NOT Made of Plastic – Biodegradable Cups, Low acid, Great Aroma.. Perfect Organic K-cups coffee! 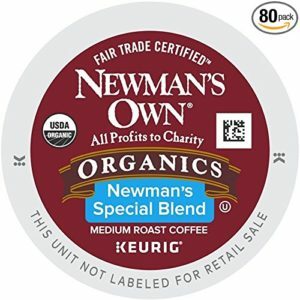 Newman’s Own Special Blend is organic, fair-trade certified coffee that provides a strong taste characteristic for the mixture of medium and dark roasted coffees. At the same time, it offers a soft and refined taste with interesting ashy and woody notes that give this coffee a special, bold taste that you may enjoy even if you are not a fan of strong coffee. In addition, this freshly roasted coffee has an amazing, pure smell that will take your favorite daily routine to a higher level. A great thing about this coffee is that it keeps the unique, characteristic flavor no matter how you combine it. It goes amazingly both with milk and sugar, and it doesn’t lose its aroma even when you add whipped cream to it. In accordance with this, you won’t make a wrong decision if you choose Newman’s Own Special Blend for the preparation of iced coffee. Newman’s Own Special Blend K-Cups come in 5 sizes, counting 18, 30, 80, 120, and 160 cups. The manufacturer has changed the package recently but the product characteristics have remained the same. Rich, bold, smooth, fair trade certified, wonderful aroma and the great advantage of this compared to other organic K cups coffee is that what this company do with their profit. Newman’s company donate profits to charity. 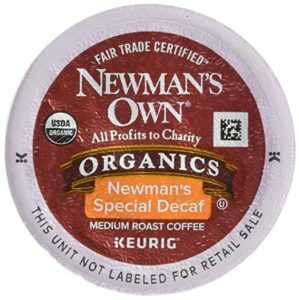 We highly recommend Newman’s k cup organic coffee. Coming from the manufacturer who’s well known for its environmentally friendly practices based on organic, sustainable, and ethical production, One Love K-Cups represent the medium roasted gourmet coffee produced using 100% Ethiopia Yirgacheffe coffee beans. With its balanced, smooth, floral notes, it provides an amazing taste that beautifully combines with brown sugar, vanilla, and exotic spices. Work with 2.0 Keurig brewers. Cups are plastic and recyclable, not biodegradable. Very good K-cups for sensitive stomachs. One Love K-Cups come in three different packages, with 24, 36, and 96 cups of pure organic coffee. 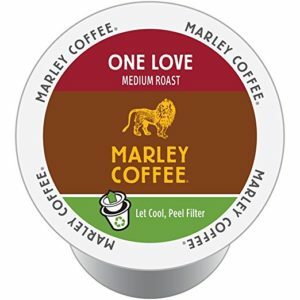 Apart from One Love, Marley Coffee K-Cups can be bought in eleven more variations but not all are organic: Buffalo Soldier, Catch A Fire, Get up – Stand Up, Light Roast Get Up, Lively Up!, Mystic Morning, Espresso Roast, Smile Jamaica, Spiced Root Rum, Talkin’ Blues, Variety Pack. Marley One Love medium roast quality ORGANIC coffee, well-balanced, so flavorful, amazingly delicious and pods are recyclable. 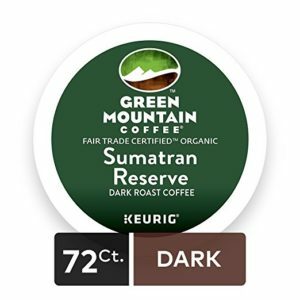 Sumatran Reserve by Green Mountain is made of 100% Arabica coffee, these single-serve K-Cups are famous for its exotical, lush, sweet taste and complex mixture of heavy aromas typical for Indonesian coffee. Dark roasted coffee used for the production of Sumatran Reserve K-Cups represents an extraordinary mixture of brown sugar taste and delicate spicy notes. These organic K-Cups packed in a beautifully designed box that symbolizes their eco-friendly production, are USDA, Fair Trade, and Orthodox Union Kosher certified. Apart from Sumatran Reserve K-Cups, Green Mountain also offers nine more different types of cups, including Breakfast Blend and Breakfast Blend Decaf, Sumatran Reserve, Columbian Fair Trade Select, Dark Magic, French Vanilla, Nantucket Blend and Nantucket Blend FT, Pumpkin Spice, and Vermont Country Blend. Bold and flavorful, strong and good dark roast coffee. We recommend this K-cups for people that like bold, dark roast coffee. Providing low acidity and deep, rich flavor of milk chocolate with extraordinary notes of cocoa, caramel, and honey, Don Pablo K-Cups are made of high quality, 100% Arabica coffee. Produced with no artificial substances, with a beautifully designed package, these K-Cups are certified organic by CCOF. What makes Don Pablo coffee famous is the mentioned natural flavor character, based on the caramelization of the natural sugars, that provides an incredibly pleasant aftertaste. In almost every our best lists on our site is one coffee from Cafe Don Pablo. You can find their coffees in our best cheap coffee beans list and in best dark roast coffee beans list. Hardly anyone can beat Cafe Don Pablo coffees value for money. They have very cheap coffees and the taste of their coffees is remarkable. You can find Cafe Don Pablo Subtle Earth K-Cups in three different packages: 80, 84, and 96 K-Cups. Why we love Cafe Don Pablo K-cup organic coffee? Best organic K cups for very low price. Not bitter at all, smooth full-bodied, great aftertaste and again BEST PRICE ORGANIC K-CUPS. 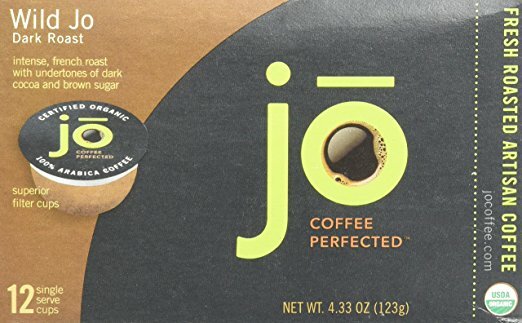 Perfectly combining dark cocoa and dark brown sugar, the intense dark roasted beans of the best quality Arabica packed into WILD JO K-Cups have no artificial additives and provide a unique, strong taste ideal for those of you who enjoy striking flavors. These organic K-Cups will surprise you with the quality of coffee brewed using superior extraction, without the annoying plastic cup aftertaste that usually spoils the aroma. WILD JO K-Cups come in three different types of packages, consisting of 12, 36, and 72 cups. Is WILD JO best tasting k cup organic coffee? Definitely the most delicious coffee on our list. Although you may not be a French Roast fan you must like Wild Jo french roast k cups. Very tasty and a MUST TRY coffee. We give Wild Jo coffee the highest recommendation of all organic K-cups coffee from our list. Providing a perfect mixture of high-quality medium roasted coffee from Indonesia and Latin America, Caza Trail K-Cups will take your coffee routine to the next level. The smooth, moderately acid taste with a well-rounded finish is what makes these K-Cups so special. In addition to its great flavor, Caza Trail Coffee also has Fair Trade and USDA organic certification. Caza Trail offers the K-Cups in 17 different tastes. Some of the variations you can find in the market, apart from the Organic Medium Roast, are Hazelnut, French Vanilla, Guatelmalan, Donut Shop, French Roast, Sumatra, and Medium Roast Extra Bold. 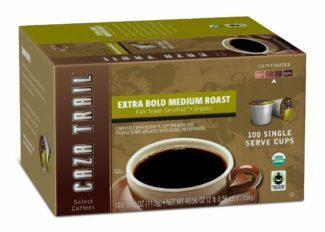 Caza Trail K-Cups come in 9 different sizes, starting from 24 cups per pack, all the way to 100 cups. Not best but very good. Extra bold. Cheap. Not as good as some other coffees on list but extremely inexpensive organic K cups. If you are experiencing difficulties trying to find the right decaffeinated organic K-Cup for you, you should not worry. There are several good-quality options in the market and you’ll probably find your perfect match among them. Our top two options are listed below. Check them out. The decaffeinated K-Cups coming from The Organic Coffee Co. are among the most popular options when it comes to this type of coffee. The 100% organic Arabica coffee is roasted to perfection providing the richest flavor and decaffeinated using the natural water process for a reasonable price. Apart from Gorilla Decaf, The Organic Coffee Co. offers three more flavors, including Breakfast Blend, French Roast, and Java Love, and it comes in three package sizes. You can choose from packs consisting of 12, 36, and 80 cups. Gorilla decaf coffee pods are compatible with most single serve brewers. Are Gorilla decaffeinated K-Cups have good taste? Taste are very good especially for decaf. 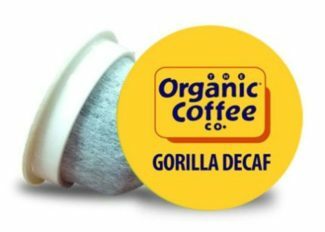 Gorilla decaf have great robust flavor. No bitter aftertaste, amazing smell for decaffeinated coffee. Most people will not even notice this coffee is decaf. The Newman’s organic coffee is decaffeinated using the natural water process. Packed with the retro designed K-Cups, it provides a strong yet smooth taste with no unpleasant aftertaste. This coffee is a great solution for all of you who are searching for the perfect medium roasted decaf coffee. You will enjoy its refined yet bold aroma with no artificial additives. One of best flavor of any decaf k-cups. Newman’s decaffeinated coffee can be found in 4 types of packages, consisting of 24, 48, 72, and 96 K-Cups. Compatible with single serve coffeemakers. If you are looking for an eco-friendly way of having your coffee using a K-Cup, you should not only choose the organic coffee but also pay attention to the characteristics of its package. Pay attention to find a K-Cup which is recyclable, biodegradable, or compostable (you’ll be able to see this mark on the package). Not all of the producers provide this type of cups but if you have the possibility of choosing a completely environmentally friendly option, don’t hesitate to do it. The coffee cultivation soil will appreciate it. We hope that we helped you to easier find best k cup organic coffee brands for you.